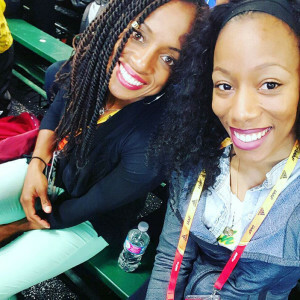 Veteran sprinter Tahesia Harrigan-Scott advanced to her fourth straight IAAF World Indoor Championships 60m semis on Saturday night, during the championships held in Portland, Oregon. Harrigan-Scott ran 7.30 seconds in her prelim and was fifth but her mark was the third best among the six fastest losers advancing. A 2008 finalist and bronze medalist, as well as a 2010 finalist placing seventh with only three race that season, who narrowly missed the 2014 finals by .0001, was fifth in her semi in 7.23 the 15th best mark of the meet. Ashley Kelly got the ball rolling on Friday night in the 400m where she finished third in her heat after running 54.95 seconds, then later learnt her time was the 13th best of the field as the first 12 advanced. Coming off winning the National Jr. Colleges Weight Throw crown in record fashion, Tynelle Gumbs opened her outdoor campaign by taking down twin sister Trevia’s Hammer Throw record with a huge personal best at the Willie Williams Classic in Tucson, Arizona. Tynelle placed fifth in Hammer Throw throw with a 48.87m heave, to take down Trevia’s 47.66m mark of a year ago. Her previous best was 44.99m. Trevia finished sixth with a 47.37 effort and placed eight in the Shot Put with 12.75m. Tynelle was fifth in the Javelin Throw with a 36.92m effort and settled for 12th overall in the Discus Throw after reaching 40.97m. In Jamaica, Nelda Huggins, representing St. Jago High School, was second in the Class I Girls 100m in 11.67—the second best mark of her career. She ran 11.85 to win the prelims and 11.75 for second in the semis. Competing at the Carolina Spring Break Classic in Puerto Rico, Deya Erickson won her heat of the 100m Hurdles with the day’s third best mark of 14.17 seconds. Kala Penn debuted with 17.04, then leapt 5.53m to finish fifth in the Long Jump. Shaniyah Caul won her 400m heat in 58.34 seconds. Ronique Todman had a 49.59 seconds mark for second second in his 400m heat, while Tarique Moses ran 50.77, in another segment. Todman ran 22.38 for fourth in his 200m heat. Akeem Bradshaw was second in the Triple Jump with a 14.57m measurement. Jonel Lacey finished second in the 400m Intermediate Hurdles, in 1:02.99, while Lakeisha “Mimi” Warner finished sixth in her heat in 1:04.89. Shaquoy Stephens ran 11.06 seconds in his 100m debut while Johnt’a Charles had a time of 11.53 in his heat. Mariah Christian finished seventh in the 1500m in 5:23.70, a mark that’s No. 5 on the All Time List.